First of all, MOM is not a backup of our knowledge. Knowledge gets modified and expands. Societies in the future who are capabale of discovering MOM will be at least as knowledgeable as us. This is why we will not store the entire Wikipediain MOM (on one side it would be in a way presumptuous, on the other hand it could be only the Wikipedia from a particular date, because it is highly dynamic). However, stories of howwe gained knowledge and insight will certainly be of interest to the future. This is why PhD theses in particular are collected within MOM- and of coursethosewikipedia-articles, which document the history of the concerned item or topic. For example, publications on gravitational waves are not collected per se but rather the means and devices we employ to detect them are worth documenting. 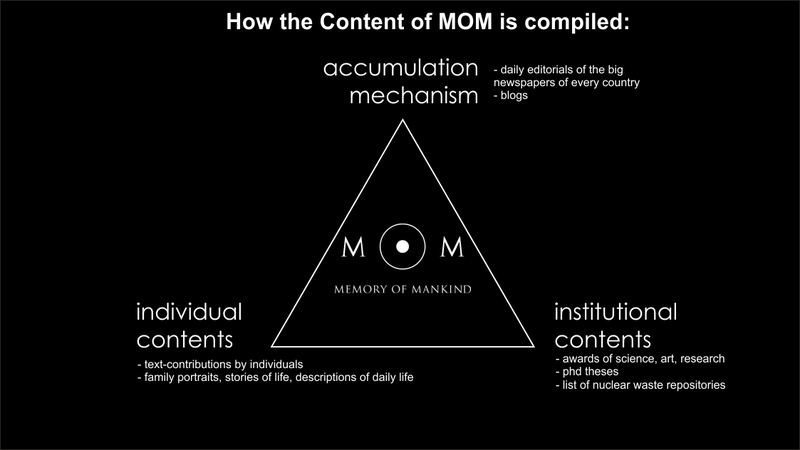 3 contents which are collected by individuals worldwide. Self-experienced or retold personal stories, description of hobbies, texts or lyrics which impressed you or influenced your life, and news-stories which describe our today; everything will be part of the big “Bottom Up Told History”. Up to now, history was written by historians – in retrospect. Today within the age of open access, open source, and crowd processing, it is possible to write our own story – by ourselves and today.